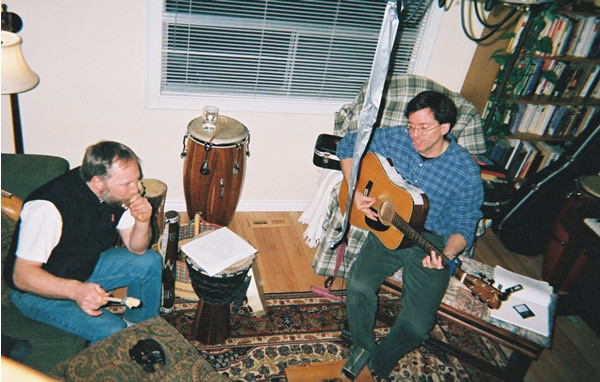 Peter and percussionist Don McPherson in pre-production of song "Duct Tape Blues" for the Juno Award winning “Proud Like a Mountain” album. How many percussion instruments can you find in the photo? Click on the objects to see if you are right. Writing and recording is already in progress for next project (CD / DVD). And it is FUN to look back and appreciate all the great musicians who worked on “Proud…”! Here Don McPherson plays the percussion frog giving a cowbell effect. Peter recalls: "In rehearsals, the frog tended to leap away with each beat... so Don was playing harmonica with one hand, hitting the frog with the other and chasing it across the floor as it tried to escape... while I tried to play and sing between waves of laughter... so we had to tape it down... with what else... duct tape!" Hear finished version at Cd Baby & iTunes … for song samples.